Getting the opportunity to return to shoot wedding films at Hever Castle is always a delight. Chrissie and Steve chose a dream wedding venue. This happy couple met whilst working for the same company. 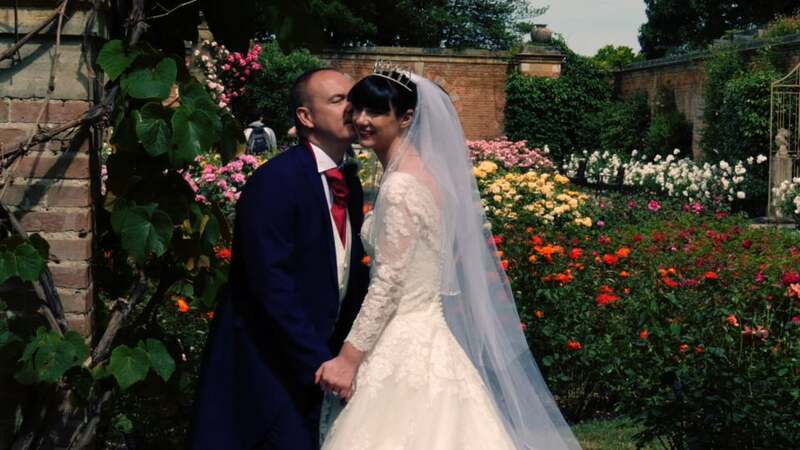 They chose a Hever Castle wedding because Chrissie loves Tudor history and fell in love with the castle when she visited it as a child. So it had been a lifelong dream to get married there (though she says she never dreamed it would happen!) When she took Steve there after their engagement he was taken with it too so was only too happy to allow Chrissie to fulfil her childhood dream. On the day we arrived early so we could take some film of Chrissie making her bridal preparations. Chrissie and Steve had chosen to hire the Astor Wing at Hever Castle. The Astor wing is a series of beautiful Tudor style buildings joined to Hever Castle offering magnificent oak paneling, ornate fireplaces, antique furnishings and an eclectic art collection. We took some great footage of the grounds before filming Chrissie making her final preparations. The moment her dad saw her in her dress for the first time was so beautiful. Now it is always great to work with other professionals in the industry and this was certainly the case working with Helen England Photography. Helen was so professional yet easy going. Her images are timeless and elegant. We know that Chrissie and Steve were delighted with them. The ceremony was held in the stately Tudor suite which was dressed beautifully by those clever people at Your Beautiful Day. After a lovely ceremony guests enjoyed a drinks reception on the beautiful croquet lawn whilst Chrissie and Steve were quickly whisked away by Helen to take some gorgeous portraits shots around the magnificent grounds and gardens of the castle. We followed and got some lovely natural shots. We wondered down to The Loggia by the Italian Lake, it was just so beautiful. The reception started with Chrissie and Steve arriving to rapturous applause and everybody kept in high spirits for some very well received speeches. The wedding cake looked magnificent and was every choco-holics dream! Evening entertainment started with a very romantic first dance that by the end saw Chrissie and Steve joined on the dancefloor by family and friends. It was the image of Chrissie and Steve embraced with all of their loved ones around them that seemed a fitting close to the wedding film of their lovely day. Congratulations to Chrissie and Steve for getting married and creating such a memorable wedding day. We hope our film will allow to relive it again and again for many years to come.